Vegetables. Eat more of them. Do not fear them. They are your friend. Your friend that you eat. This dish will make the people finish all of the asparagus in the dish. There will be none left, and that’s a victory, if you ask me. 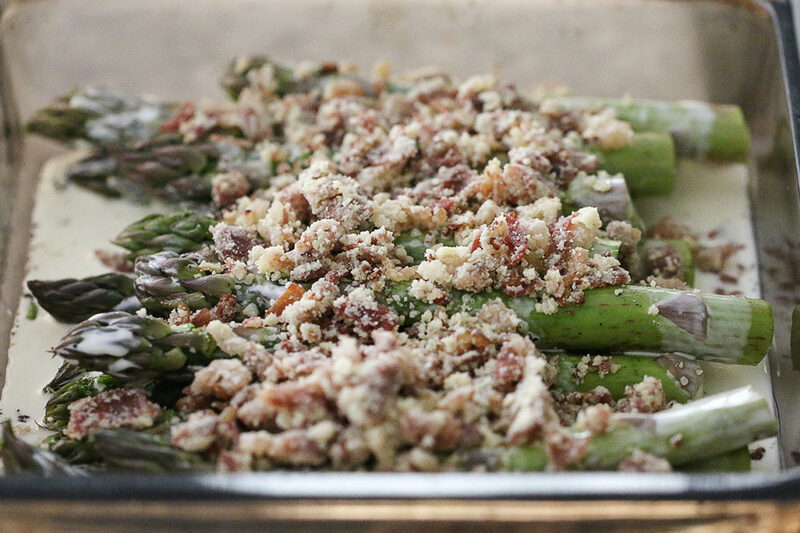 Place asparagus in an 8×8 baking dish. Season well with salt and pepper. Pour heavy cream evenly over asparagus. Preheat oven to 400 degrees. Heat olive oil to medium high heat in a large non stick pan. Cook shallot until soft, about 2 minutes. Add prosciutto pieces, stirring to fry them up evenly until they are crispy. Stir in almond flour until “crumbles” form and cook an additional 3-4 minutes until it starts to become golden brown. Pour prosciutto crumbles evenly over asparagus. Roast in oven for 10 minutes. Remove from oven and sprinkle parmesan on top. Place back in oven and bake an additional 10 minutes. I love the idea of asparagus with prosciutto and parm and will try the topping without bathing asparagus in cream. If I can find perfectly thin asparagus I might even try them raw with a prosciutto parm vinaigrette. Thanks for the inspiration. I make it dairy free with coconut cream and omiting the part, it’s DELISH!! Working my way through your cookbook. Favs so far: Cheese Stuffed Mini Peppers (good cold too), Pan Fried Bone-in-Rib Eye (YUM! ); Zucccini Pasta Bolognese, Lemony Chicken Thighs (Delish but messy. I put parchment paper over it), Beef and Portobello Stew ( I added red wine), Grain Free Granola, Strawberry Ice Cream. Can’t wait for your second cookbook. I love to cook and eat!! I love it, Sonja!! Me too!!! This comment is making me hungry! !